Come join the Alternative School Network for an evening of laughter at a Pre-Valentines Day Comedy Show. 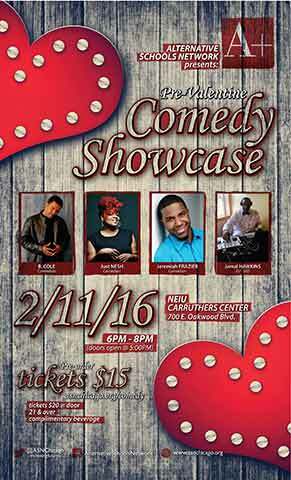 Three of Chicago’s top comedians will be there to bring the laughter and entertainment. This event is a fundraiser for the Alternative School Network to host future events for student benefits. Be sure to stop by the Information table to collect flyers and brochures about The Alternative School Network. Video footage of past events that the schools have participated in will be shown for your enjoyment. Can't attend? We would appreciate a donation. To purchase TICKETS please click on the REGISTER (Individual) or REGISTER (Group) buttons below.